2 mins to prep, 2 mins to cook! A quick and easy gourmet dinner! 1. Pat tuna steak dry with a paper towel, then cover in 1/4 tsp olive oil. 2. 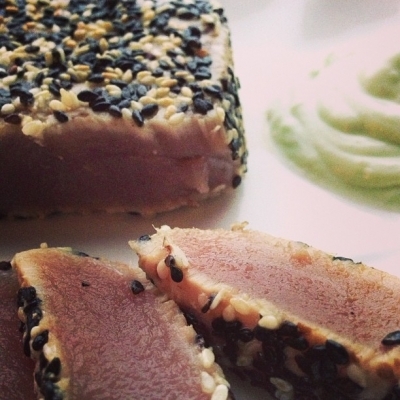 Press tuna into sesame seeds until completely covered. 3. On high heat, sear tuna in remaining olive oil - approx 30 seconds on each side, depending on how rare you want it. 1. Mix yogurt, wasabi, garlic, and salt.